HAVANA, Cuba (CNN) -- A day after a wholesale shake-up in the Cabinet of President Raul Castro, brother Fidel said Tuesday that two of the leaders were ousted after they became seduced by the "honey of power," which led them to an "unworthy role." 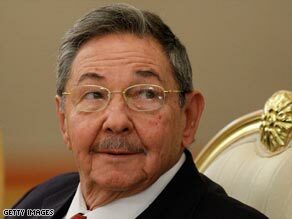 Cuban President Raul Castro is moving his own people into power, analysts say. The elder Castro said in a posting on a state-run Web site that he was consulted about the appointments, though that had not been necessary "since I gave up the prerogatives of power quite a while ago." In an article headlined "Reflections of comrade Fidel, healthy changes in the Cabinet," Castro said he did not propose most of the replacements. "Almost without exception, they arrived at their jobs proposed by other colleagues from the address of the party or the state," he wrote. "I never dedicated myself to that job." The ailing former Cuban president, who handed power to his brother a year ago, referred to two of the ousted leaders cited in news reports. "None of the two mentioned by the wire services as most affected spoke a word to express non-conformity," he said. "The reason was another. The honey of the power for which they had known no sacrifice awoke in them ambitions that led them to an unworthy role." Though Castro neither elaborated nor identified who he was referring to, news reports have cited the removal of Foreign Minister Felipe Perez Roque and Vice President Carlos Lage from their Cabinet posts. No mention was made of removing Lage from his other post as vice president of the Council of State. Though a number of other long-time leaders had their jobs changed, as well, Fidel Castro rejected "rumors" that the changes represented the substitution of "Raul's men" for "Fidel's men."